Liverpool University has had a student newspaper since way back in the early twentieth century. There are folders of back copies on yellowing paper in the SJL Special Collections. Rather archaically it began life as the Liverpool Gazette and was published out of the Guild with varying levels of frequency (monthly / weekly) every year I think until the late 90s when it was swallowed by the newly formed Liverpool Student Media. LSM was a colaboration between the 3 unions at LU, Hope and JMU to provide one paper – the Liverpool Student - for all three universities. LSM lasted a few years, then folded itself in rather scandalous circumstances, of which more shortly. I worked as editorial cartoonist and de facto assistant editor at the Gazette and the Liverpool Student for maybe 5 or 6 years from the late 90s whilst studying for an English degree and saw the last thrashings of a long established tradition in its death throes. So it is interesting after all that to see a new Liverpool student newspaper taking to the stands, especially one that looks so slick. My first efforts at cartooning for a large readership were roughly drawn and not all that funny, tho fortunately there was no competition for the job. I mocked the foibles of university life and the actions of government, a Conservative mob which was in the process of doing away with grants and introducing loans. Over the next couple of years I got to learn page layout and spent many hours in the Gazette offices on the top floor of the guild battling with an old version of Quark and small gangs of small scallys who'd snuck into the building to kick in doors and rob stuff. I say offices, there was one large office barely used except for beginning of year recruitment meetings and a smaller office half the size of a bedsit with a grubby mac and a scanner. Sometimes we climbed out of the window and played on a small enclosed square of the union roof in sunny weather. I liked designing pages and thought I did a reasonable job. As a developing radical I also wrote articles and imported them from professional writers so that I could further my agenda to educate the student mass in the ways of being righteous. We ran a series of articles by campaigning journalist John Pilger, for example, telling tales of far off wars and imperialist conquests when most people were interested only in music, sport and the price of a pint. My drawing style improved the more I went on until a strip I was running in the Gazette – called, rather cleverly, Real Academik - got picked up by the Guardian Higher Education Supplement where it ran for a couple of years. By this time the paper was actually being published on newsprint - previously it had been on some sort of shiny heavier paper - and occasionally ran a page in colour. Advertising was always difficult to get tho it wasn't essential as the Guild still financed much of the project. Editors were given free reign by the sabbaticals who were the notional bosses of the project - the editorship would later become a sabbatical post at LSM where there was more union control - and we pretty much went for it. The first headline of one editor's tenure proclaimed 'University Invests in Arms Trade' and it was true - a well researched article showed the university had a shares portfolio which generated profits from arms sales. The saga ran for months and the Senate people got quite irritated, especially when it was pointed out that it involved the John 'Give Peace a Chance' Lennon bursary. In cartoon terms I concentrated on international issues, producing an editorial drawing once a month for a sceptical readership. There were complaints about a general lack of local focus and at one point a distraught sabb advised that we run more cookery features. Gazette closed at the turn of the century with a funereal black cover and a tombstone graphic and we said goodbye to the offices in the Guild, stacked high with undistributed back copies and overflowing ashtrays. Reopening the following September at the Haigh as a third party in the Liverpool Student, many of the Gazette news team migrated to the new paper with its smart new iMac and salaried editor with his own office. In my years at the paper, editorship of the Gazette had always been an all male affair and was handed down in an informal way thro the consensus of the people who worked on the paper. Was it sexist? Well the behaviour of the young men in the office was, on a day to day basis, sexist enough tho I don't think they planned to keep the few women on the paper out of the top job. At LSM the Unions held a formal interview for the £15k / year sabbatical post and acted as day to day bosses of the project. I applied for the first editorship and lost out to the then current Gazette editor who had spent most of the year making the sabbs laugh in the offices downstairs. It was a bitter moment for me as I had a newborn son and was looking for a bearable job. To lose to a sycophant was pretty grim. LSM also employed someone full time to get advertising, a job that had always fallen to reluctant and largely unsuccessful editors at the Gazette. The Liverpool Student ran for three or four or five years. I designed the masthead, advised on design and did cartoons, including caricatures of Edwina Currie, Peter Mandelson and Lord Owen (then LU chancellor) who were interviewed by the editor. Edwina was dined in luxury by an editor somewhere on Bold Street, an act which seemed very wrong. She later turned down an offer to buy the caricature original (I drew her as a witch casting a spell to reinvent herself as a radio hosrt and author after she lost her parliamentary seat). All was going swimmingly until the paper published a story criticising one particular JMU president, a known tyrant, who went on to get funding for the paper cancelled. And so it finished. The end, or so it seemed, of a long tradition of print news on Liverpool University campus. 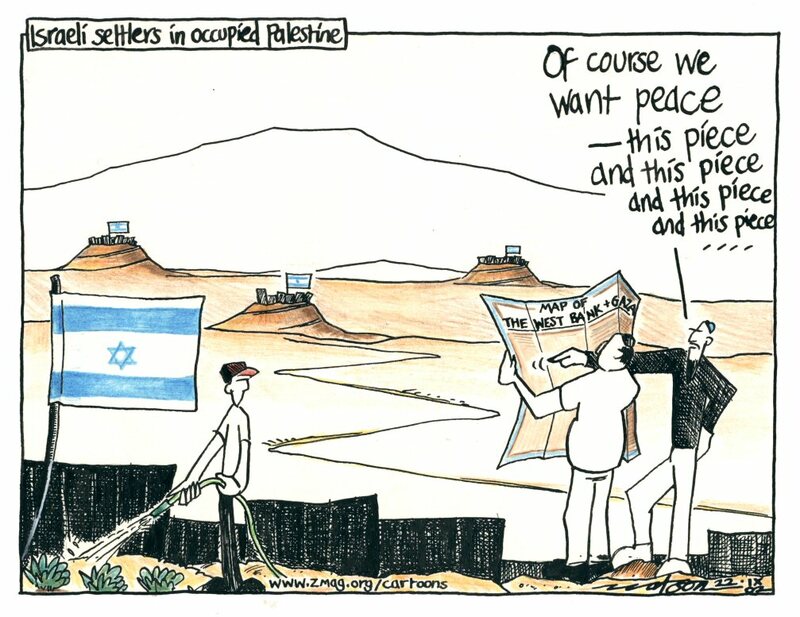 During this time I resigned as editorial cartoonist due to ongoing hostility between myself and one of the editors, then I returned, only to be hunted down by an angry and violent looking JSoc gang for drawing an anti Israeli settler cartoon. I was out of the office when they arrived but the editor bravely faced down the intimidation. In all this time I covered many issues from Iraq 1 to consumerism to freshers fayre and enjoyed my time as the quirky individualist contributer. Shortly after I left university, when the British public returned the Labour party to government in 2005 despite them supporting the US invasion of Iraq, I gave up political cartooning as I realised with great disappointment that nothing I'd drawn had changed much of anything. I still think some of those cartoons were pretty good, it was just that the message fell on deaf ears, the work of an idealist cast before pragmatic swine.